Mark Westcott is a TV documentary director from London. He worked on the Discovery channel series ‘Man, Woman, Wild‘, a survival show featuring American special forces expert Mykel Hawke and his broadcaster wife Ruth England. 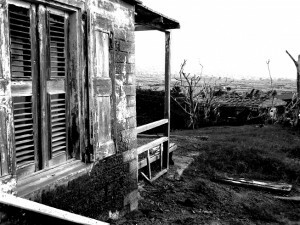 In 2011, the series took the film crew to the Caribbean island of Montserrat, where they got special access to explore regions laid to waste over a decade ago by eruptions of the island’s volcano. 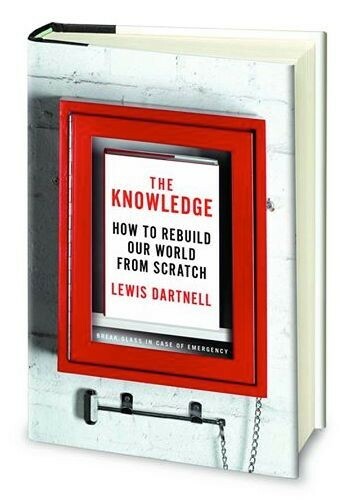 In this guest post, Mark describes his experiences in this devastated landscape of decaying collapsing buildings, scavenging vital supplies from abandoned kitchens and garages, and the feral cattle: like a localised apocalypse. “Montserrat is a curious place of two extremely different halves. Whilst the northern half of the island ticks every box on the ‘tropical paradise’ list, much of the south is abandoned following a series of eruptions of the Soufrieres Hills volcano. 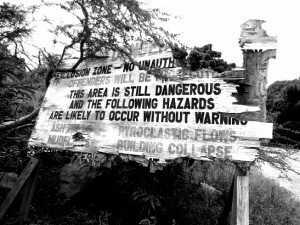 The port town of Plymouth, once the largest on Montserrat with a population of 4000, was evacuated in 1997 and remains deserted today. 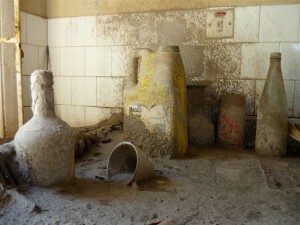 Volcanic ash smothers most of it, but houses still stand in this modern-day Pompeii. Host Mykel Hawke wanted to demonstrate survival techniques in an urban, post-apocalyptic environment and few places capture that empty eeriness better. Although there is an exclusion zone around the town for safety reasons, some suburbs can be entered with permission. The residents of Plymouth left in a hurry taking only what they could carry. Kitchen cupboards remain filled with canned and bottled goods, familiar brand names recalling more certain times. Furnishings moulder and tattered curtains flutter by windows shattered by volcanic debris but a bed of sorts for the night and a place to sit can still be found. Cars remain in private garages just as they were left, but the tyres now perished and the batteries flat. Plants grow wild in living rooms that would once have been the pride of the home, watered by the rains dripping through damaged roofs. It is a world exactly as described in The Knowledge. For the survivor there are tools to be scavenged – kitchen drawers filled with bric-a-brac yield knives, matches, lighters. Out-buildings can be scoured for garden implements, woodworking tools, nuts, bolts, spanners, screws, and nails. There is even welding equipment to hand (useful for as long as the gas cylinder lasts, although see The Knowledge for instructions on making your own). Uncontaminated water can be found in covered heating systems and bleach from store cupboards is useful to purify water from other sources such as the indoor ponds, teeming with insect larvae, which once were swimming pools. The little reminders of life such as family photographs, children’s homework books, a half-full bottle of Mount Gay rum can sap your spirit in this lonely place.